Apart from putting a bowl of soup or beans in the microwave and switching the power on boiling is probably the first cooking 'technique' that most of us acquire. Whether it's boiling an egg or some spuds, it's easy to master and the equipment is minimal: just a tap, a saucepan and a reliable supply of gas or electricity are necessary to get from raw to cooked. Use a minimal amount of water. 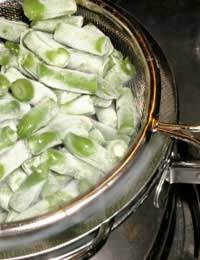 Most vegetables can cook in very little water but we tend to get used to filling the pan. Just put a couple of centimetres in the pan but always cover the pan when you're not using much water, so it doesn't dry out. Check the pan regularly, turning down the heat if necessary, or topping up with a little more water. Check the tenderness of the vegetables often. Ideally, they should still have a little bite to them. Drain immediately when they're cooked then put them back in the pan and cover again to keep them warm until you're ready to serve. Remove the egg from the fridge a few minutes before you're ready to cook. Shake a few drops of vinegar into a small pan, place the egg in the pan and cover with cold water. Bring the water to the boil then reduce to a simmer. Cook for 3-4 minutes from when the water comes to the boil (depending on the size of the egg and how well done you like it). Meanwhile, toast some bread and prepare the all-important soldiers. Remove the top of the egg as soon as you take it from the pan, to stop it cooking any more. Enjoy! If you're using a stackable steamer, always check the manufacturer's instructions for specific cooking times for each ingredient. You can calculate when to add each one, so that everything is ready together. Don't let the water evaporate - keep a close eye and make sure it's topped up before you start cooking. Check your ingredients towards the end of the stated cooking time - individual preferences mean you might like them cooked just a little less or more. Hopefully, you should now have a little more confidence in your boiling and steaming techniques and you'll get more out of your food by ensuring that more of the good stuff stays where it should.